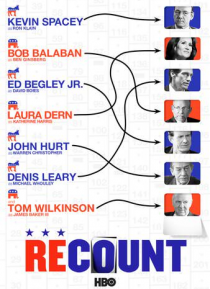 In 2000, the presidential election boiled down to a few precious votes in one state - Florida - and a mandatory recount that would add 'hanging chad' to the American political lexicon. Haggling over every ballot, Republican and Democratic campaigners waged a 36-day street fight in Florida with the presidency of the United States as the ultimate prize. Kevin Spacey stars in this gripping drama that… examines the torturous process that culminated in the Supreme Court decision in Bush vs. Gore.